Allows you to download files as well as starting/exiting from command line. Can pause download and resume as long as the server supports it and the program stays open. 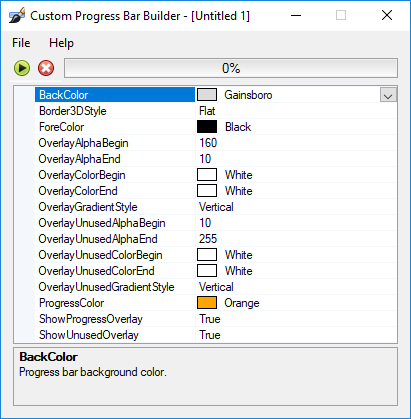 Customizable progressbar style with the progress bar builder that comes included in the download. Start downloads from the command line. /f=filepathandname - Save file location and name. /u=downloadlocation - http or https url of download. /ec - Exits when complete. /ow - This will overwrite a file without confirmation if download is started from command line. *USE AT YOUR OWN RISK*.